Delosperma (dee-loh-sperm-ah); Carpetweed Family (Aizoaceae). Succulent perennials native to South Africa. Low, bushy, spreading or erect plants with oval green, fleshy leaves covered with glistening white hairs. 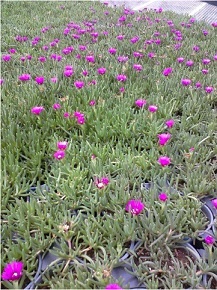 Delosperma is an outstanding weed-smothering groundcover that will brighten places where other plants fail to grow. With daisy like flowers that cover succulent, threadlike, low-growing foliage, Delosperma makes an impressive display and is a perfect choice for green roofs, rock gardens, slopes or arid locations. If planted in a container use lots of sand and small gravel to insure good drainage. Commonly called ice plant, Delosperma are tough plants that thrive in sun, sandy soils and drought. Most are reliably hardy from USDA Hardiness Zones 4 and 5 to Zone 11. Drought resistant, do not over water this plant from South Africa..
Use as groundcover for rock gardens or for slopes, perfect for the xeriscape landscape, this plant is so cool, it is cold to the touch in the morning.. If planted in container use lots of sand and small gravel to insure good drainage. Attracts butterflies, deer resistant, drought tolerant. Hot, sunny conditions keep the flowers coming all summer long. PLANTING: Plant in a sunny location in a light, very well-drained soil, 12 to 15 inches apart. Very drought tolerant. MAINTENANCE: Once established, cut back the untidy growth each spring to encourage new growth. Easily propagated from cuttings.